I saw this story mentioned on the Sydney Morning Herald, in which BP was caught altering photographs of their command center to give the appearance that they were busier then they really were. Other websites were quick to point out even more discrepancies in the photographs released by the oil company. A spokesman for the company had admitted to the altering of at least one image. Flaws in the editing of the original command centre photograph became evident after Americablog made a close inspection of the images, revealing small areas of white space and overlapping graphics. 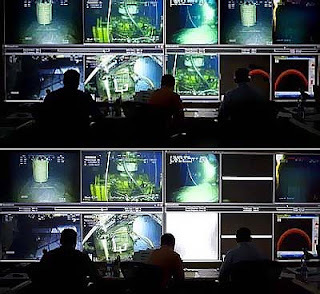 Following the Americablog report on Monday, BP posted the original unaltered image and spokesman Scott Dean admitted that two screens were blank in the original picture and that a staff photographer had used Photoshop software to add images. The altered image has since been removed and the company has not yet commented on the other images highlighted by the Americablog website and Gizmodo. The images found on Gizmodo were even more interesting, showing a picture of a helicopter cockpit that was obviously changed - while the picture depicts a view overlooking the disaster from the cockpit of a helicopter, there were certain telltale signs of alterations, but none as obvious as the fact that the instrumentation in the cockpit put the helicopter at a height of 0.3m, which makes the image impossible. With this recent discovery, it makes you wonder what else British Petroleum had manipulated to present their company in a more positive light. It also makes things a little bit harder for all those BP apologetics out there who claim the company is working in the best interests of Gulf residents.